It's 6pm on the evening of October 4 and while the sun is fading fast, the temperature remains mild and Piccadilly Circus is awash with noise and animation - tourists eagerly snapping famous sights and struggling with voluminous shopping bags, buoyant office workers chatting and swigging outside pubs and bars, pretending it's still somehow summer. The groundfloor of the nearby Waterstones — not merely the biggest bookshop in London, but Europe overall — is similarly lively and loud, although three lengthy flights of stairs above, all is deathly silent. That's not for a lack of people — a sizeable crowd sits in rapt anticipation, waiting with baited breath for the arrival of Mark Urban, BBC Diplomatic and Defense Editor, and Luke Harding, Guardian foreign correspondent. They're gathered for the official launch of Urban's latest book, The Skripal Files. 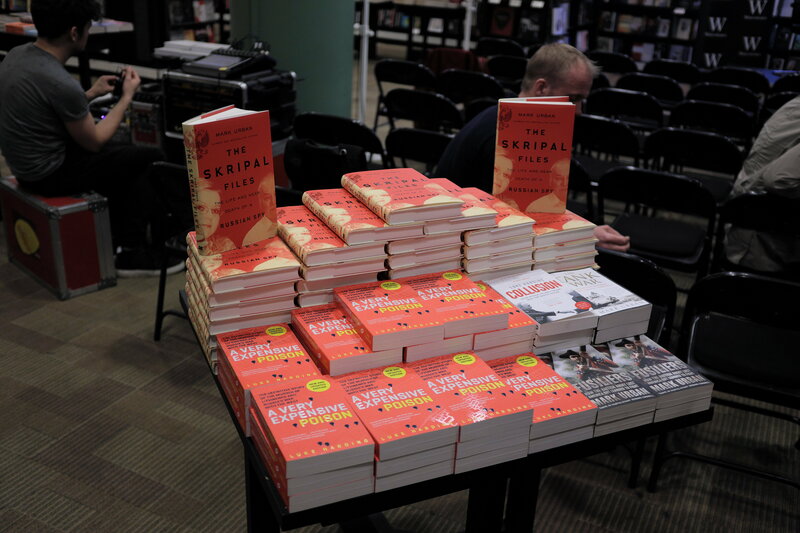 Based on hours of exclusive interviews conducted with Sergei Skripal in the year before his poisoning in March, it's said to be "the definitive account of how Skripal's story fits into the wider context of the new spy war between Russia and the West". Attendees are promised an evening of invaluable insight into "the dynamic between Russia and the West at present: where we are after Skripal's poisoning, and where this charged global dynamic may be leading us". Piccadilly's a fitting venue for the talk indeed — home to both the Itsu restaurant where in November 2006 Alexander Litvinenko dined with nuclear waste expert Mario Scaramella, leaving traces of polonium-210 in their wake, and ‘In and Out', a private members club in which MI5 and MI6 are said to have recruited many an agent during the Cold War. Half an hour later, with the event meant to be underway, no sign of Urban or Harding and all complimentary glasses of wine comprehensively drained, the throng's collective patience has understandably faltered and conversations — in both English and Russian — have broken out everywhere. However, their din is eventually extinguished by the lanky compere's announcement that the dynamic duo have arrived, followed in short order by their actual arrival. Sat on stage, Harding quickly sets the tone for the evening, managing to variously refer to The Skripal Files as "terrific", "brilliant", and "superb" in the span of less than a minute and informing Urban he "loves his writing style", all the while sporting a thoroughly appreciative, reverent beam, which won't fade for the duration of their discussion. Nonetheless, his first query is a potentially problematic one for Urban — how was it he came to meet Skripal so long before the double agent became the subject of long-running international controversy? After all, he has a spooky knack for always being in the right place at the right time, having a front-row seat as events of seismic significance unfold. Moreover, it was contact Urban didn't disclose publicly until several months after the incident. Urban explains he'd wanted to write a book about the history of East-West Espionage for some time — the uncovering of the ‘Illegals Program' in 2010 and subsequent ‘spy swap' that saw Skripal returned to Britain provided him a compelling opening wedge. He then set about attempting to get in touch with Skripal, an apparently unproblematic feat given Skripal's name, address and contact details were freely available on the UK electoral register — a somewhat unbelievable lack of discretion for a man still actively working for four separate intelligence agencies. However, this intimate ‘in' to Skripal's life apparently wasn't sufficient, and it took some goading from "intelligence people" on Urban's radar to facilitate a meet between the two. Urban's embedment with a Red Army combat operation in Afghanistan in 1988, during which he interviewed Skripal's then-commander, was enough to cinch an initial meeting. 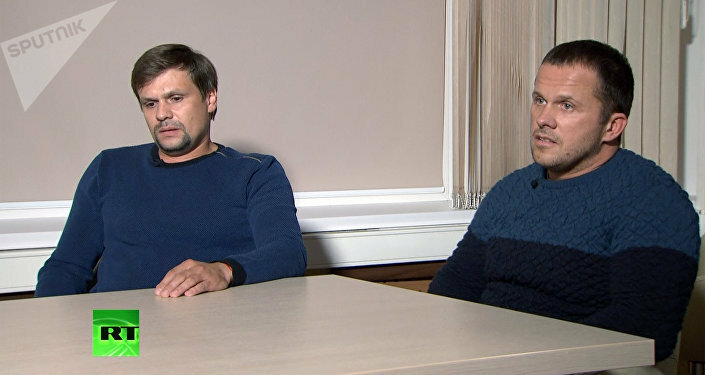 When they finally rendezvoused in Skripal's MI6-bought home in Salisbury, he quickly began spilling the beans. While working in the Russian diplomatic mission in Madrid, Spain in 1995, he was approached by a "British guy" from the UK's local embassy — in fact an MI6 operative. They quickly struck up a warm bond, in reality a cultivation exercise — praised as "brilliantly effective" by Urban — aimed at turning Skripal double agent. It was apparently a relatively easy sell — the faceless "British character" simply showered Skripal and his wife Lyudmila with gifts, exploiting Skripal's oft-avowed irritation at not being sufficiently remunerated for his work. "Lots of people who work in the intelligence services complain of the stingy pay!" Urban announces to some guffaws from the audience — how and why he's aware of this grievance goes unexplained, and unasked. So it was that in exchange for a paltry initial payment of US$3,000, Skripal provided MI6 with sensitive details of the GRU's organizational and command structures, along with the names of many undercover agents. This covert relationship continued after Skripal returned to Moscow due to health reasons in 1996, with intelligence sent to Britain via the classic spy movie expedient of secret messages written in innocuous books using invisible ink. Lyudmila would then travel to Spain and deliver the tomes to his MI6 case officer. The BBC journeyman concedes he found Skripal's conversion difficult to square with the man's apparently enduring patriotism — over the course of their conversations, it quickly became clear he viewed his home country extremely positively, praising the 2014 Crimean reunification and dismissing suggestions of a Russian invasion of Ukraine. "If we marched in, we would reach Kiev in days. The Ukrainians need leaders…they're sheep without a shepherd," he allegedly declared at one stage. Such views were evidently extremely unwelcome to Urban, and he rationalizes this apparent cognitive dissonance — to himself and the audience — by suggesting Skripal was a "Soviet Nationalist", someone who still believed wholeheartedly in the struggle of Communism and Mother Russia against Western imperialism. The proposition seems to render Skripal's rapid conversion to double agent all the more baffling, especially given he'd investigated and captured traitors previously, and knew how easily he could be "busted" — but it does allow Urban to gloss over the awkward question of why Skripal didn't believe Russia was responsible for his poisoning upon regaining consciousness. A lack of explanation — at least, convincing explanation — is a recurrent theme over the course of the evening, as is the liberal use of the caveat "I think", especially when discussion turns to Skripal's poisoning itself. Evidence of Russian state involvement in the attack, Urban says, is "overwhelming", to which Harding retorts "you don't believe they really were interested in seeing Salisbury's spire?" to widespread laughter — but when the chuckles fade, he seems hard-pressed to explain why the GRU would try to kill Skripal, especially in the manner they allegedly did, acknowledging just how transcendently inexplicable the UK government's official narrative of the case is, if only indirectly. "It is strange they chose to do this so soon before Russia's Presidential election, and the World Cup…but ultimately we sent a team there, so…I mean still, why then? It does seem like unnecessary risk-taking and contrary to Russia's typical legalistic approach to issues, like Syria. The key turning point for me and I think a lot of other people was the RT interview. All that talk of ‘slush'…I think it was a deliberate show of contempt, of defiance, to warn other potential defectors. It's like the attempted hacking of the OCPW building…I mean…we do this stuff, but we don't get caught!" Urban rambles. Getting nowhere on facts, Harding asks Urban whether he thinks Russian President Vladimir Putin is "proud" of the alleged GRU operation — again, the BBC's Diplomatic and Defense Editor seems stuck. "I think Putin wouldn't think it was worth the risk…there must've been no briefing in advance. I mean, these guys' superior officer obviously didn't speak to him. They didn't use appropriate intermediaries…"
The talk terminated, Harding offers the audience the opportunity to ask questions of their own, in turn giving Urban the opportunity to bluster, mythologise and self-promote yet further. The collected learn, for instance, that despite having had no contact with him after the incident, Urban is absolutely certain Skripal is still alive, and was able to include material in his book on the double agent's thinking, health and activities since, due to tipoffs from "sources", whose identities he refuses to disclose. His conversations with Skripal were also conducted "90 percent in English, seven percent in Russian, and two percent in Spanish" — which language comprised the remaining one percent, and how Skripal's apparently poor English skills weren't a significant barrier to communication, were again unexplained. Indeed, such is the lack of clarity in evidence, Sputnik decide to raise the stakes. "You've made several references to the ‘British character', and ‘British guy' who recruited Skripal. You of course mean the MI6 agent Pablo Miller, who you were in a tank regiment with in the British Army. Did he play any role in connecting the two of you, and what's the nature of your relationship with him today? And, why do you think the British government issued a D-notice blocking mention of him in the media after Skripal was poisoned?" we enquire. The questions are enough to transform Harding's previously indefatigable beam into a frown, and Urban looks someway more displeased. After a few rare seconds of silence from both, Urban breaks the impasse. "OK…well…there's quite a lot of questions in there…erm…firstly, I don't accept the first part of your question, that he was the person I was alluding to earlier. I just don't. Yes…I did serve with him [Miller] in the army, I left the regiment in 1983, our lives went very different paths and they diverged…and that's that really. There's no D-notice on him, there's a reminder of a standing D-notice concerning identities of members of the intelligence services. If you want to understand how D-notices work, ask yourself to what extent that restricted discussions of Christopher Steele. Did that stop anyone from publishing his name? No, because it has no legal force. Journalists did look at that angle and found nothing, but if they'd found something of substance I don't think they would've felt at all restrained from publishing," Urban intones. Attempts by Sputnik to respond are desperately drowned out by an evidently flustered Harding, who moves onto another questioner, the last audience query he'll solicit. Were it not for the Guardian journalist's stifling intervention, perhaps the true nature of the D-notice issued March 7 could've been outlined by Sputnik— for it's somewhat different to what Urban alleges. "The issue surrounding the identity of former MI6 informer Sergei Skripal is already widely available in the public domain. However, the identities of intelligence agency personnel associated with Sergei Skripal are not yet widely available in the public domain. The provisions of DSMA Notice 05 therefore apply to these identities. If any editor is currently considering publication of such material, may I ask you to seek [the] advice [of the Defense and Security Media Advisory Committee] before doing so?" The wording — particularly "intelligence agency personnel associated with Sergei Skripal" — may account for why in an article published the same day as the D-notice, the Daily Telegraph declined to mention the name of a "security consultant" employed by the company that compiled the Fusion GPS ‘dodgy dossier' on Donald Trump, "who lived close to Skripal and is understood to have known him for some time". This is almost certainly a description of Miller. Furthermore, that the D-notice didn't block reference to Christopher Steele in the media is entirely unsurprising, given his name had been "widely available in the public domain" for over a year prior to the poisoning, due to his unmasking as the mastermind behind Fusion GPS' utterly discredited Trump dossier. References to Steele in the mainstream media would thus not contravene the D-notice's requirements — conversely, any editor seeking the "advice" of the DSMAC may well have been asked not to mention Miller. Urban has been contacted for clarification on these key points, but as of October 5, a reply is as yet unforthcoming.